Huskee Log Splitter Review - Worth The Money? Our Huskee log splitter review is designed to give you good, quality, field tested opinions about the Huskee 22 ton log splitter and whether or not it's a good investment. I bought this hydraulic wood splitter from the Tractor Supply Company (TSC) 7 years ago. At the time it was a tough decision. Is it really worth the money? We bought an outdoor wood furnace and were burning about 10 cords of firewood a year, which was always a lot of wood to split with a maul (all I had at the time). Every year I would take my maul and go swing for an hour or so until I was too tired to continue. For a few years it worked fine. Then, as our family began to grow and I had less time to spend on firewood, we decided to invest in something to help speed up the process. I started off by doing what I do most.....research. 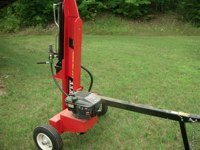 I read online Huskee log splitter reviews just like this one, talked to people who already owned a hydraulic wood splitter and looked at the overall price range. Still not quite convinced spending around $1000 was something I was ready for, I came up with an idea. I called a local rental company and asked if they had a wood splitter for rent. Later that day I was hauling home a Huskee 22 ton log splitter that cost $50 for the day. Renting the wood splitter for the day allowed me to do two things. I was able to try it out before spending the full price of a new splitter and I was able to split A LOT of wood in a short period of time. After I spent the day splitting firewood with the rented log splitter I was amazed. I could not believe how much wood I could split compared to swinging my heavy maul. Plus, I could split firewood for hours without becoming exhausted. I did have one problem with the rented splitter. The hydraulic fluid return hose had a crack in it right where it connected to the wood splitter. It was caused by split logs falling on the hose. I fixed it myself in just a couple of minutes. I just cut the split out of the hose and attached it back on the wood splitter. After renting the Huskee 22 ton log splitter I was convinced it was time to purchase my own. Then, to make the decision even easier, a few days later I received a coupon in the mail for 10% off any item from TSC. A week later I was hauling home a brand new Huskee 22 ton log splitter. Huskee makes larger versions of the log splitter but after renting the 22 ton I could not find a log the splitter could not handle. So, I could not see why I needed to spend more money on a larger model. The splitter retails for around $1000. After the 10% off coupon it cost around $900. At this time I've had the wood splitter for 7 years. I check the fluids, take good care of the machine and have always stored it inside. I've let family and friends borrow the machine on several occasions and everyone who has used the machine agrees it's a great investment. It splits anything. If you have a piece of wood you want to split for firewood, this machine will do it. It splits in both horizontal and vertical modes. Switch to vertical to prevent lifting heavy logs on to the machine. I don't use this option much because I find it's faster to lift the log on to the rack but it's nice for those pieces that are just too big to pick up. It has an auto return. After the log is split, move the handle to the auto return and the hydraulic cylinder will cycle back as you grab your next piece of wood. Compared to other models, the price was relatively inexpensive. Well worth the money! Anyone can use it. My wife has no problems using the machine while I run the chainsaw. Just like the rented splitter, the hydraulic fluid return hose has been punctured 3 times. The hose is soft and easily damaged by falling logs. The logs hit the hose where it attaches to the fitting on the machine causing the hose to split. It's an easy fix, just cut the hose and reattach it to the machine. Some sort of guard or reinforced hose would be great. The cover on the engine rattled loose over time and stripped out the screw that holds in in place. We fixed it by adding a larger screw and have not had a problem with it since. The unit bounces around a lot when you tow it behind a vehicle. It's to be expected because the splitter is fairly light with a narrow wheel base. If I'm going to haul the splitter a long ways, I actually load it into a trailer and haul it that way...it's just easier. "This article is just exactly what my experience has been and what I feel is the best solution for 95% of firewood burners. My first experience with Huskee was a friend's, with the 20 ton designation and only a 5 HP Tecumseh Engine. This unit was 20 years old and only the connector, between engine and hydraulic pump changed. 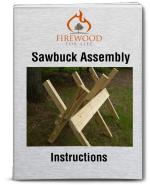 This was all that I needed for splitting almost any piece of wood I could put to the Huskee. As time went on I got a newer unit of my own, a used 22 ton, 6.75 HP model, and it too, is as much as I will ever need. It simply splits anything I put under the wedge. I, wholeheartedly recommend this splitter, and not a larger one in almost all situations. In earlier years I rented various log splitters, with some brands not in business anymore, however they were good units. I have been; cutting, splitting and burning wood for 45 years, so a tad qualified, IMHO." "I bought my Huskee splitter for $900.00 and absolutely love it. My only issues with it was that it did not have a vertical locking pin and the base plate is small. This allowed many of my larger pieces to slide off if they were abnormal in shape. After my first fall with the splitter, I took it to a local welder to add these things, which cost $75.00. It has made the splitter safer in my wife's eyes and was well worth it. I would highly recommend the Husky splitter." "I have the Huskee 22 ton log splitter. I actually received the log splitter from my step father. The unit was practically brand new. When I first got the unit home I could not get it to start. I removed the carb and cleaned it thoroughly. Rust has already set up in the gasoline bulb so I cleaned that thoroughly as well. Once I reassembled the unit it started and ran flawlessly. I split wood for about seven hours that day w/o any problems. Fast forward to February and I went out to start the log splitter to split some wood. It took me over an hour to get it started. I ended up pulling off the air filter box and spraying starting fluid down inside. Finally, the machine ran. Pulling and tugging on the unit completely wore me out and it had me very frustrated. Most people would have given up. I estimate over one thousand pulls before it started. One other thing about the log splitter, the stickers for the choke and gasoline fuel line are backward. Basically, if you want to turn the choke on, you turn it off according to the sticker. Also, in order to get your gas line open, turn it to the off position. Further, there is no primer bulb as the directions call for. Like most other small engine items that can be mass purchased at a box store, it seems like the carburetor is defective and needs continual maintenance to keep it running." "Biggest piece of junk I ever bought. If it's a little cold out it will NOT start!! Even after pulling it 100 times, starting fluid, cleaning plug, still wont start. It will run when it's warm out when you don't need it, but the ram will slow down almost to a crawl. Will never buy again. Will not recommend. Better off splitting wood by hand. Out of 10 stars, I rate this splitter a -3." "I have a 22 ton Huskee splitter too. It was very hard to start in the cold but after talking with someone with a lot of experience, he told me to push the primer about ten times. Now it starts with about 3-4 pulls and runs great." "I own the Huskee 22 ton splitter. It's 5 or 6 years old and has the Kohler engine. The motor always ran hot until I removed the plastic cover and allowed air to flow through the engine. Now, it has oil leaking out around the cylinder shaft. When the cylinder goes down to split the wood there are no leaks. However, when the cylinder returns back, about 12 inches before it stops, fluid leaks out at the gland nut. Hopefully I can fix this. I used 2 gallons of fluid today. I've added Stop Leak which may have slowed the leak." "The Huskee log splitter has been a very good investment for me. I’ve made a lot of money with it. My only complaint is that it’s not made for long distance or high speed travel. The owner’s manual even tells you that. Common sense should tell you that just by looking at it. I replaced the Briggs & Stratton engine because I wore it out. I keep my splitter in a garage out of the heat, cold, sun and rain, which goes a long way. I have not had any issue with a hydraulic hose being in the way of falling logs. You basically should take care of your equipment and it will take care of you." 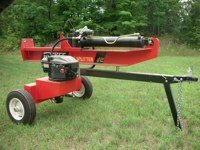 "I purchased the Huskee 28 ton log splitter from Tractor Supply about 4 years ago. This splitter has worked great. The biggest problem with it is everyone wants to borrow it. The hose did split and leaked. Replaced with the next higher rated hose and haven't had a problem since. This machine has split cords and cords of wood. My current problem is finding a 4 way splitting head for it and finding out who makes it." Considering everything I've mentioned in this Huskee log splitter review, would I recommend this to a friend? Yes, without a doubt. The machine is very affordable compared to other models and it has done everything I've asked it to do. It's been a great machine that shows no sign of slowing down.